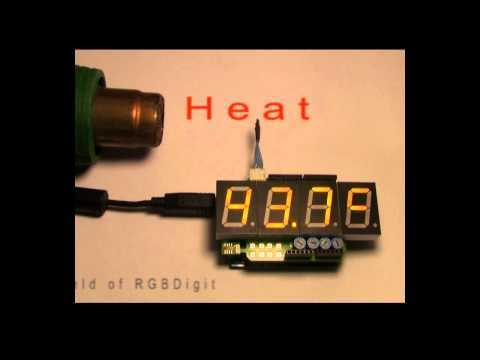 RGBDigit is the first 7 segment display with programmable RGB LEDS, requiring only 3 wires to control. These digits require a lot of solder work. If you want to have a simple 4 digit clock, you would have to solder 100 wires. Also, a more advanced micro controller is needed, since the Arduino UNO doesn’t have enough ports for even one of these digits! – By using standard neopixels the RGBDigit’s can also be controlled by micro controllers other than the Arduino UNO e.g. raspberry pi. – Minimum number of connecting pins, using only 3pens in from your micro controller and 3 pens out that are used to connect the digits with each other. – Cascading up to 10 RGDigits, using only 3 input wires for all the digits. – Currently there is already a RGBDigit library available written by a RGBDigit user . – At this moment there is a Arduino UNO shield and a Arduino Micro 4 or 6 digit backbone available. Hardware and demo software available via the Site or Webshop.